The bell in the Morris Bell Tower was made by the American Bell Foundry of Northville, Michigan about 1896. It was originally mounted on the first Morris Fire Hall on Boyne Avenue in Morris, in 1905, as a fire alarm and the 9:00 o’clock curfew, and rung by attendant T. N. Bestwick for $5 per month. The bell continued to ring until 1948 when a new fire hall was built and a siren was put in its place. It is alleged that the bell was originally shipped to Emerson by riverboat on the Red River, the main means of transportation from the United States at the time. It disappeared and mysteriously showed up in Morris. There is no record in the town minutes of how or when the bell came here. The bell tower was designed by Bronson Stevenson. 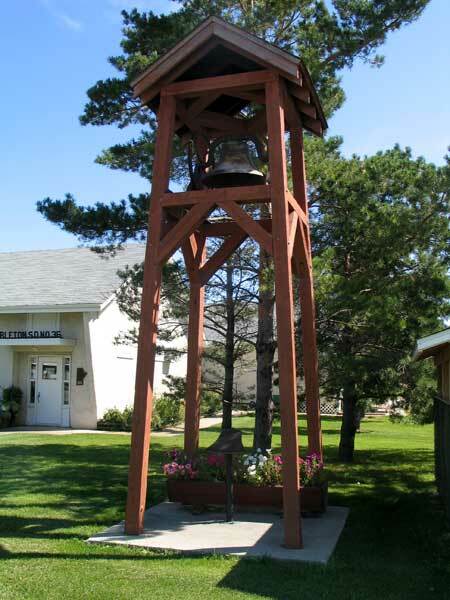 It was built and the bell mounted and dedicated on 1 July 1992, on the grounds of the Morris & District Centennial Museum.